Indian digital payments giant Paytm has revamped its mobile app to make it more user-friendly and to take on its rivals. The revamped Paytm app offers the new personalized app experience for users. Also, notably the Money Transfers have become even simpler with the new app. “We are very excited to introduce the new revamped interface on Paytm App. 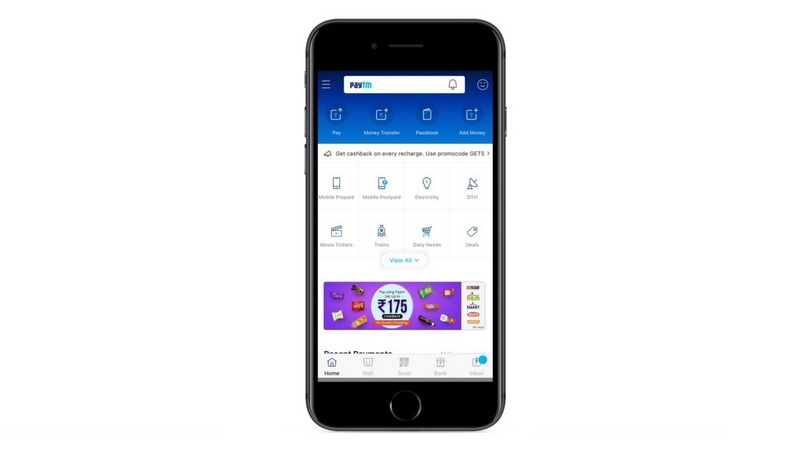 In continuation of our constant effort to provide our customers with the best user experience, the new design is refreshing and has upgraded to some of the most important flows including Money Transfers,” said, Kiran Vasireddy, COO – Paytm. Following are the changes that have been introduced in the revamped Paytm app. Users will now see a fresh look at the Paytm App’s home screen. According to the company, the new home screen is simpler and let the customers focus on some of the most used features with the personalized home screen. Customers will now see relevant categories based on their usage and the rest features will be under the View All button. Customers can also make one-touch quick payments from their Home Screen under the Recent Payments section now. This new section has all recent payments, the users have made at stores or retail outlets or money they have paid or transferred to their friends. With the revamped Paytm app, money transfers will become simpler and faster. Consumers will now be able to send money from any bank account to any bank account at 0% fee. They can also add beneficiaries for making faster repeat payments. Moreover, customers can send money to anyone using any of bank account beneficiaries, UPI address, Aadhaar number or to any Mobile number. The Paytm Passbook which shows your account history and balance has also been revamped to present all information in just one snapshot. The new passbook now allows customers to see a summary of account you hold on Paytm, i.e. Savings Account, Fixed Deposit, UPI, Wallet, Food Wallet, Gift Wallet and more. The Paytm profile section has also got a personalized experience. The most relevant items will now be visible upfront in the profile. The user’s QR code has also leveled up and it allows someone to send money or get themselves added to contacts and start a chat. Users can save this QR Code to the phone’s gallery. The Paytm Scanner has also got an upgrade. The above-mentioned changes are not visible in the current version of Paytm app available on Play Store. The update might roll out soon for all users.